The Bisons ready for an attack during a game at Investors Group Athletic Centre. With the Duckworth decided, the Bisons and Wesmen still had conference obligations to complete. For the men’s volleyball and women’s basketball teams it was unfortunately more of the same with losses, but for men’s basketball and women’s volleyball, the weekend ended with victory. The Bisons rounded out the weekend with a 3-2 win Saturday over a resurgent Winnipeg squad. After being swept in straight sets the day before, the Wesmen battled hard in the opening two sets Saturday. With 25-21 and 25-23 wins, Winnipeg looked like it could pull off the upset, but fate had different plans. The Bisons stepped back onto the court for the third set and strung together a pair of six-point scoring runs to lead 13-4. Winnipeg was knocked on its heels and could not recover as the Bisons rolled to a 25-12 set win. Manitoba kept up the pressure in the fourth set, pummelling its downtown rival with a 26-16 score to force a deciding fifth set. The two sides battled back-and-forth in the final set until a Josie Abbott kill sealed the win 16-14 for Manitoba. The Bisons now sit sixth in the conference at 11-9 and are closing in on clinching a playoff spot. 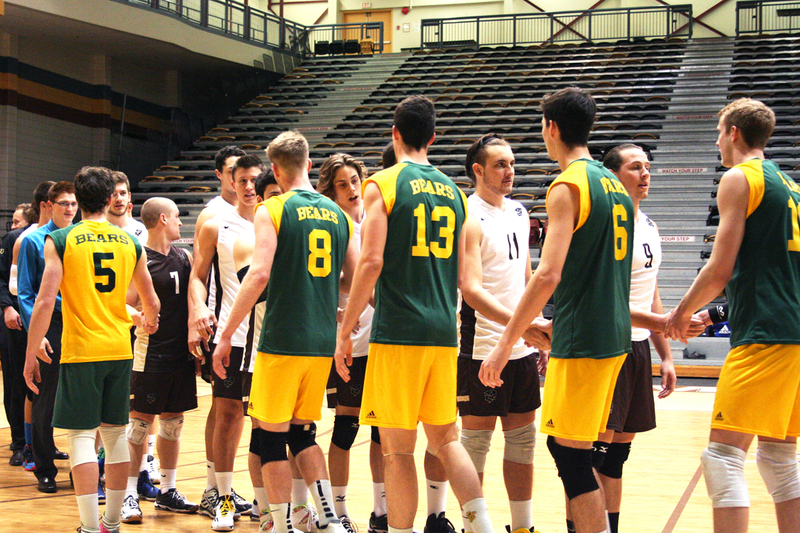 Winnipeg made quick work of the Bisons men’s volleyball team in a 3-0 win Saturday at Dr. David F. Anderson Gymnasium. The two sides traded points in the opening set until Winnipeg strung together a seven-point run to take a 14-10 lead. From there, the Wesmen controlled the pace of play en route to a 25-20 set win. 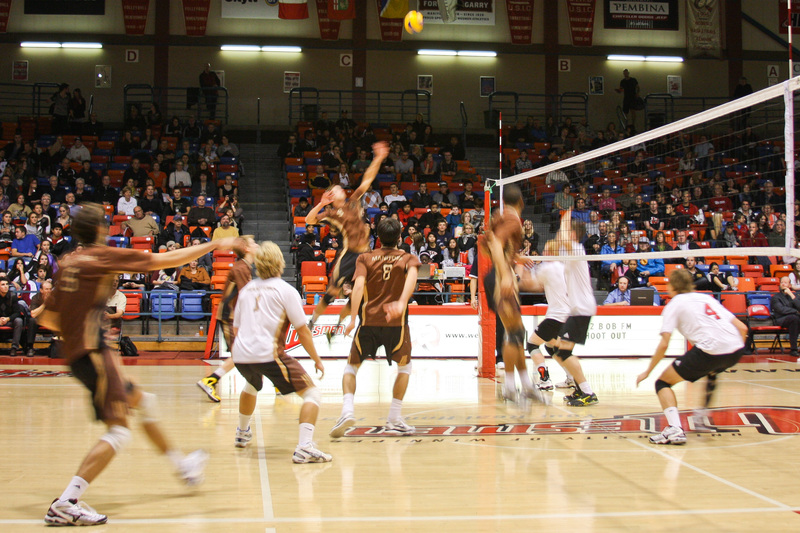 A lopsided 25-18 second set win for the Wesmen pushed the Bisons on the brink and a solid third set put Manitoba away. Winnipeg strung together three separate four-point runs to take the set 25-20, and the match. The Bisons have now lost four in a row and sit 10th in the conference at 7-13. With just two games remaining, the Bisons need to sweep the 14-4 Trinity Western Spartans to stay alive. The U of M women’s basketball team lost a close 68-64 match to the Winnipeg Wesmen Saturday at Investors Group Athletic Centre. Wesmen forward Faith Hezekiah was on a mission, posting a double-double of 28 points and 18 rebounds. Taylor Randall spearheaded the Bisons offence with 17 points and Nicole Konieczny scored a double of 12 points and 11 rebounds. “I think we showed a lot of resiliency, especially when the ball wasn’t going in the net for us,” said Bisons forward Claire Harvey. The Wesmen opened the game with a 16-2 scoring run. Manitoba responded with 10 straight points to cut the lead to four, but Hezekiah stopped the Manitoba momentum with a bucket, ending the frame 19-12 Winnipeg. The visitors held a 29-22 lead in the second frame, but Emma Thompson scored five points to cut the Wesmen lead to 29-27 at halftime. Winnipeg began pulling away in the third but Randall and Konieczny each scored four points to keep the Bisons in the game. Winnipeg led 49-43 entering the fourth. The Bisons clawed back into the game, and a fourth-quarter Konieczny three tied the score at 53. Winnipeg regrouped, put together an 8-0 run to take the lead and held on to win the close match. Following the game, the herd’s four graduating athletes Harvey, Konieczny, Tianna Mighty and Tiara Licsi were recognized. “I think you look into the crowd and you see everyone that you’ve met over the years,” said Konieczny. A Rashawn Browne three-pointer was the difference in a thrilling 81-78 win for the Bisons men’s basketball team over the Wesmen Saturday at Investors Group Athletic Centre. Browne scored a game-high 22 points, while Sean Tarver netted 21 points for the Wesmen. “My teammates just got me open looks, credit to them,” said Browne. Winnipeg opened the game with a 14-0 run and Manitoba answered with an 8-0 run, capped off by a Keiran Zziwa steal and breakaway layup. The Wesmen held a 17-14 lead after the first. Winnipeg led 26-24 in the second when they strung together seven straight points to expand their lead to nine. The Wesmen led 39-35 at halftime. An early 8-0 run got Winnipeg ahead by 10 in the third quarter, but Manitoba battled back to close the gap to just six points at 56-50 entering the fourth. With Manitoba trailing 77-74, Zziwa drained a three to tie the game at 77. On the next possession, Winnipeg turned the ball over and Zziwa found Browne for a wide open three-pointer to take the lead with just 37 seconds remaining in the game. Don Dayrit missed a game-tying buzzer beater and the Bisons won 81-78. Manitoba finishes the regular season at 10-10, good for ninth in the conference, and will face the Wesmen again in the opening round of the playoffs.